"Benthic" refers to life on or in the ocean bottom; animals swimming just above are "benthopelagic". The shallow zones are the Intertidal (between high and low tide levels) and the Subtidal (on continental shelves). 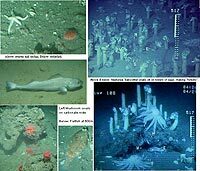 The deep trenches (about 6000m down to 11,000m or so in the Mariana and Mindanao/Phillipine Trenches) are sometimes called the Hadal zone. These have been little explored, but a new type of hybrid sub is now being used for this purpose (its first expedition was in spring 2009). The surface of most areas is mostly mud and organic ooze, though some bathyal slopes are rocky. 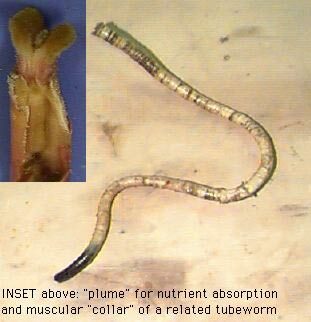 Most life here must also cope with low food supply, and again most food chains start with detritus and bacteria. The most common fishes are the rattails or grenadiers; the most common large invertebrates are echinoderms such as sea cucumbers, seastars; but there are many other animals such as sea anemones, sponges, molluscs, crabs, seaspiders (pycnogonids), burrowing worms of many types; etc. Echinoderms such as sea cucumbers have been seen at 10,200m depths! For the biology and geology of the Mariana Trench, click here. Rising from the seafloor all over the world's oceans, seamounts are hills and mountains that do not reach the ocean surface. 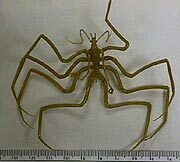 There are thought to be over 30,000 of these, most of which are unexplored. 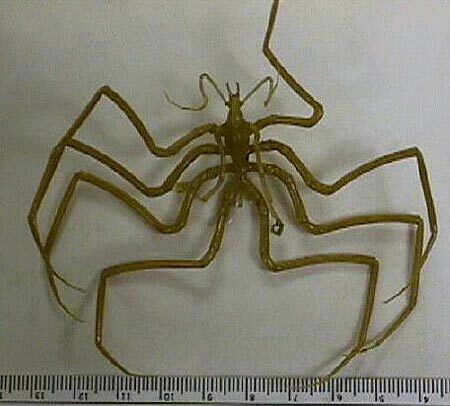 Recently several expeditions have studied some of these, and are finding a large number of new species of animals. See Seamounts Online for information. 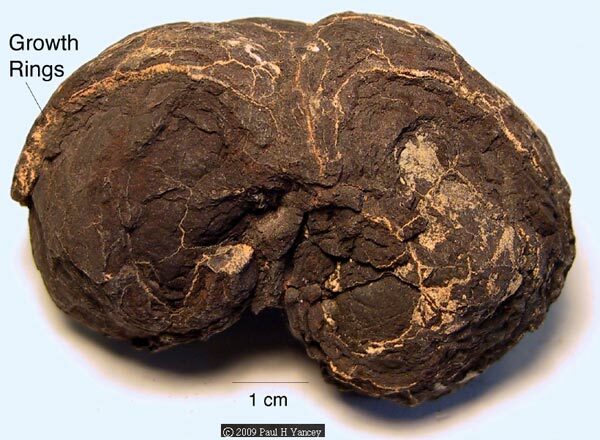 In some places on the abyssal plain are dense fields of manganese nodules (right)--rocklike formations made of growing rings of metal oxides, made by uncertain processes. Perhaps microbes are involved, for the deep mud has many bacteria/archaea including iron-oxidizing ones that normally use natural iron for energy. 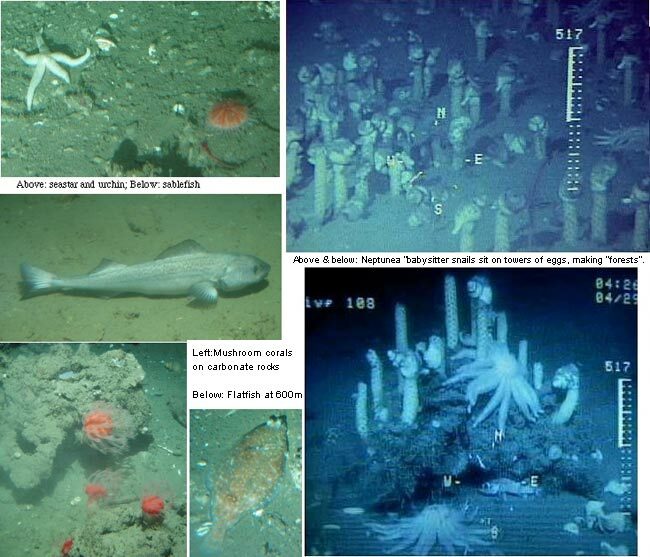 Microbes like these are currently consuming the wreck of the Titanic, which lies at about 4,000m. Cold hydrocarbon seeps, mostly along continental margins, where gases (methane--sometimes as methane-hydrate ice and hydrogen sulfide) and oil seep out of the sediments and also provide abundant energy. By some estimates, there is more energy locked up in these methane ices than in all (other) fossil/hydrocarbon fuels combined. In both cases, microbes use these energy sources and are the base of the food chain; they often live symbiotically with animals, especially large gutless tubeworms and clams. Tubeworms at seeps in the Gulf of Mexico may be the oldest living animals in the sea (over 200 yrs old; see Nature Feb. 3 2000 issue, p.499). See the Cold-Seep Tubeworm, to the right. Tubeworms at vents may be the fastest growing animals in the world. 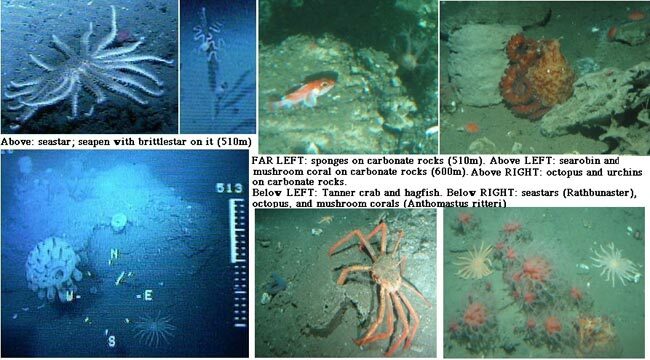 Animals at seeps and vents can grow in great abundance since energy is not in short supply. 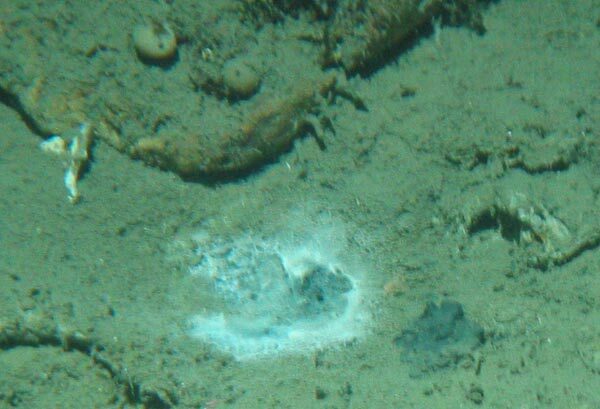 The vent microbes use geothermally-produced energy (usually as hydrogen sulfide), in a process called chemosynthesis (see link to ONR site for more information). It has been claimed that these are the only ecosystems totally independent of sunlight. However, they probably do use some molecules such as oxygen originally from the sunlit zones. Vents are also being studied as possible sites where life first began on Earth, and perhaps where life might originate on other planets and moons such as Europa. More on Seeps and Vents.